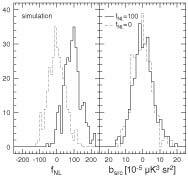 WMAP First-year Paper Figures, E. Komatsu, et al. Nonlinear coupling parameter ƒNL as a function of the maximum multipole lmax, measured from the Q+V+W co-added map using the cubic (bispectrum) estimator (eq. ). The best constraint is obtained from lmax = 265. 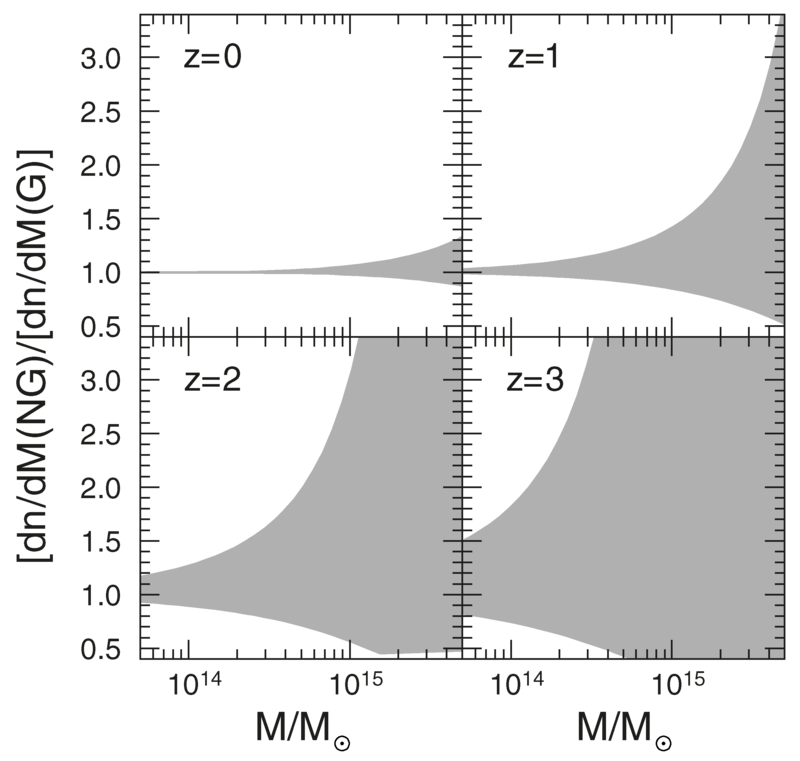 The distribution is cumulative, so that the error bars at each lmax are not independent. Left panels show the Minkowski functionals for WMAP data ( filled circles) at nside = 128 (28' pixels). 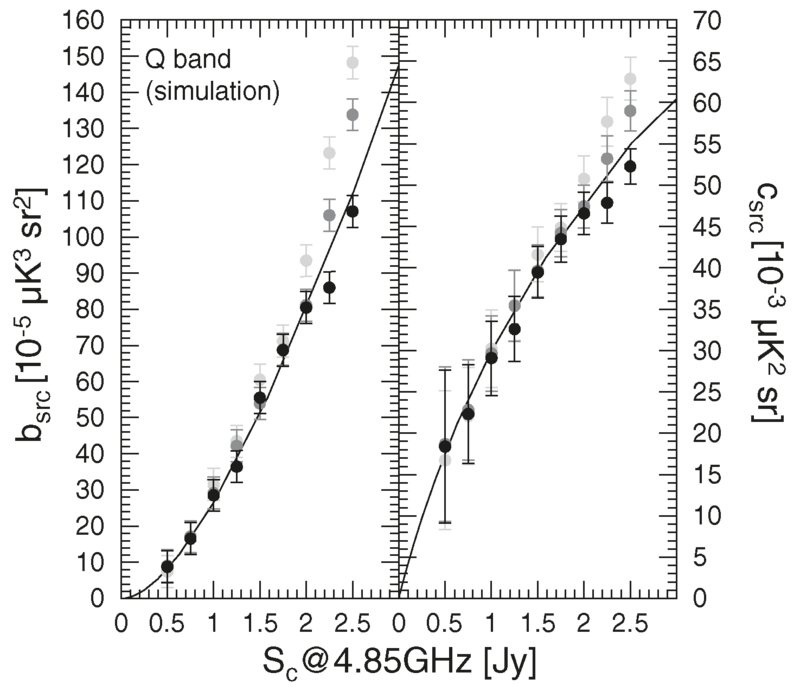 The gray band shows the 68% confidence interval for the Gaussian Monte Carlo simulations. 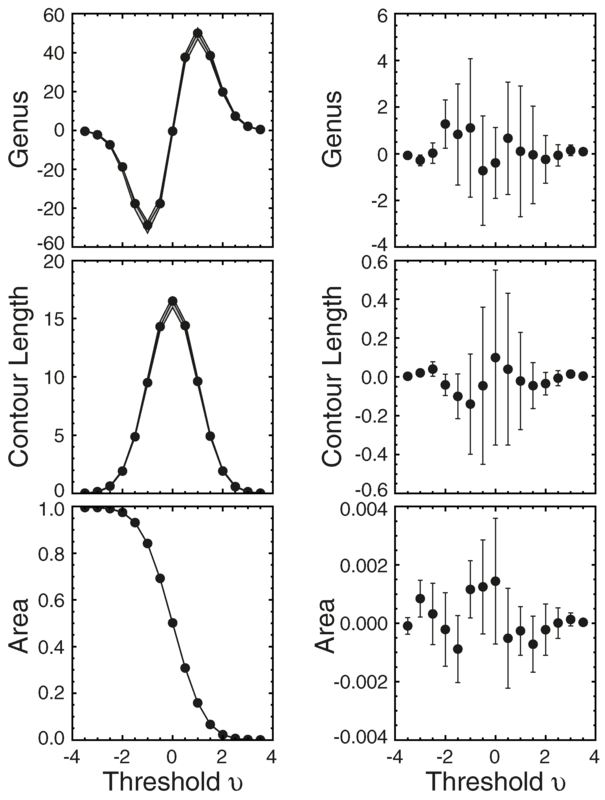 The right panels show the residuals between the mean of the Gaussian simulations and the WMAP data. The WMAP data are in excellent agreement with the Gaussian simulations. 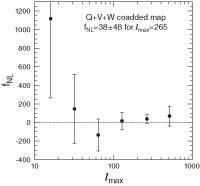 Limits to ƒNL from χ2 fit of the WMAP data to the non- Gaussian models (eq. ). The fit is a joint analysis of the three Minkowski functionals at 28' pixel resolution. There are 44 degrees of freedom. 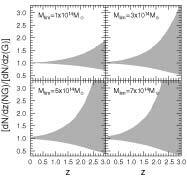 The Minkowski functionals show no evidence for non-Gaussian signals in the WMAP data. 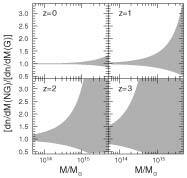 Limits to the effect of the primordial non-Gaussianity on the dark-matter halo mass function dn/dM as a function of z. 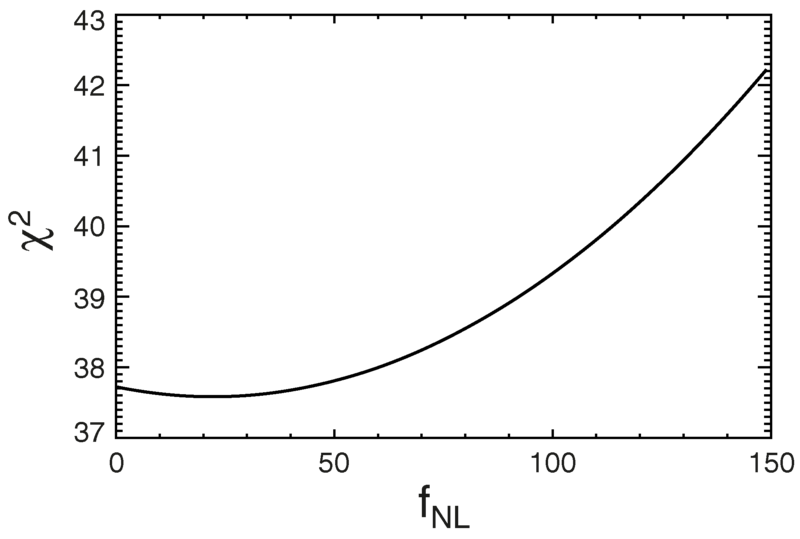 The shaded area represents the 95% constraint on the ratio of the non-Gaussian dn/dM to the Gaussian one. Same as Fig. 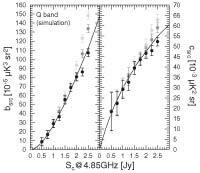 4 but for the dark-matter halo number counts dN/dz as a function of the limiting mass Mlim of a survey. 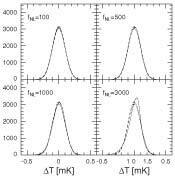 Point-source angular bispectrum bsrc and power spectrum csrc. 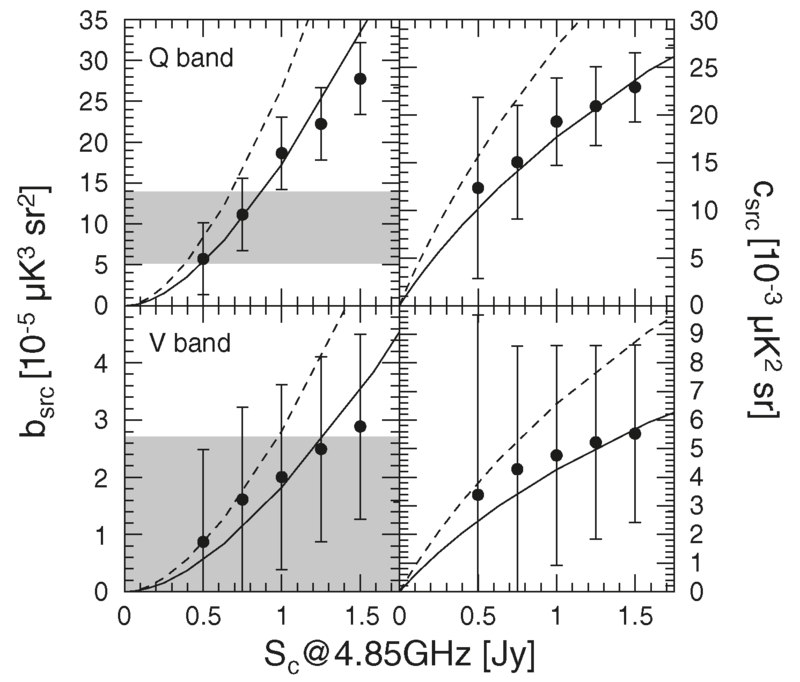 The left panels show bsrc in the Q (top panel) and V bands (bottom panel). 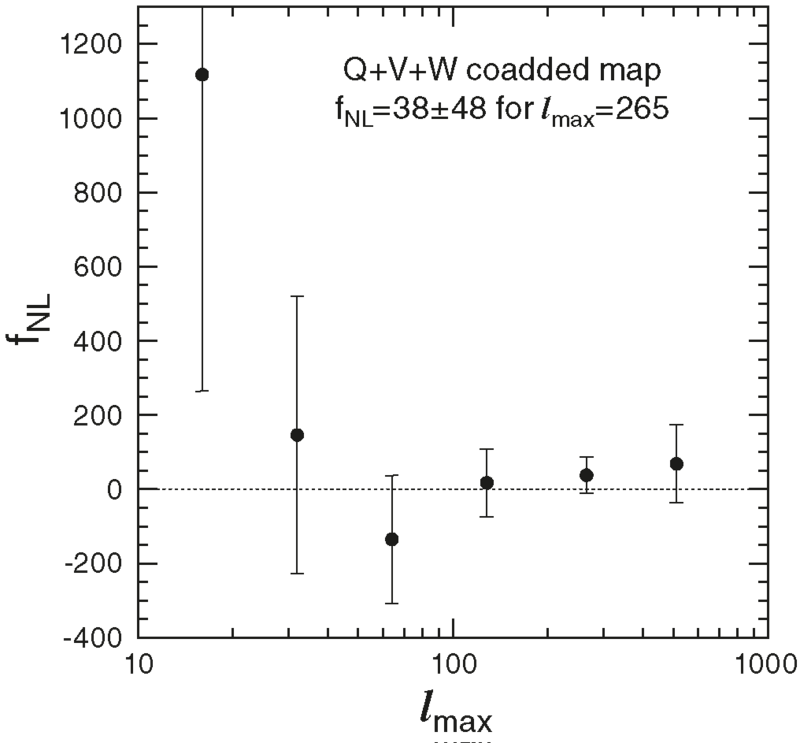 The shaded areas show measurements from the WMAP sky maps with the standard source cut, while the filled circles show those with flux thresholds Sc defined at 4.85 GHz. The dashed lines show predictions from eq. (17) with N(> S) modeled by Toffolatti et al. 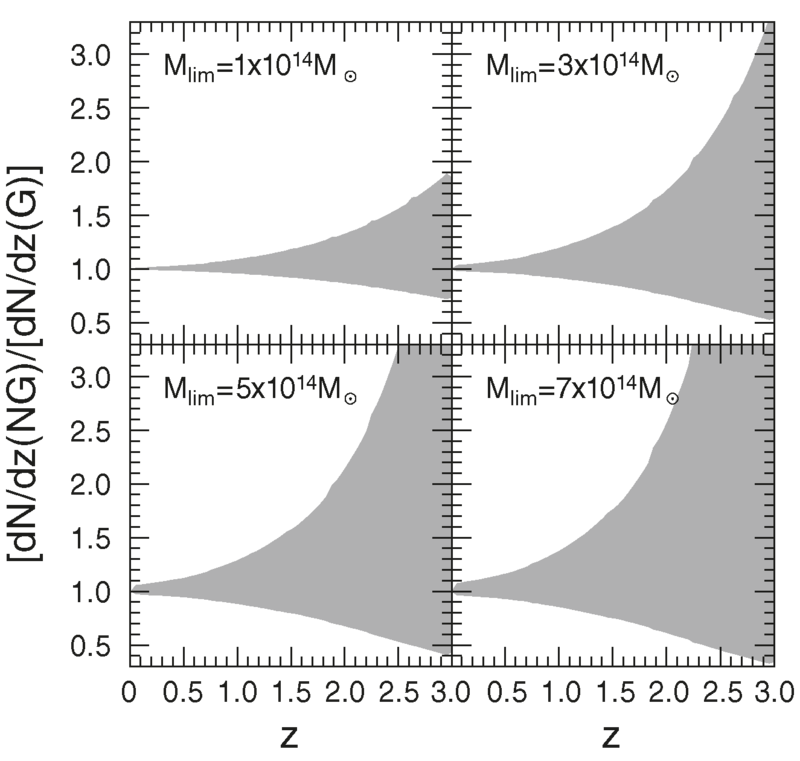 (1998), while the solid lines are those multiplied by 0.65 to match the WMAP measurements. The right panels show csrc. The filled circles are computed from the measured bsrc substituted into eq. (19). The lines are from eq. (18). The error bars are not independent, because the distribution is cumulative. One-point PDF of temperature fluctuations measured from simulated non-Gaussian maps (noise and beam smearing are not included). 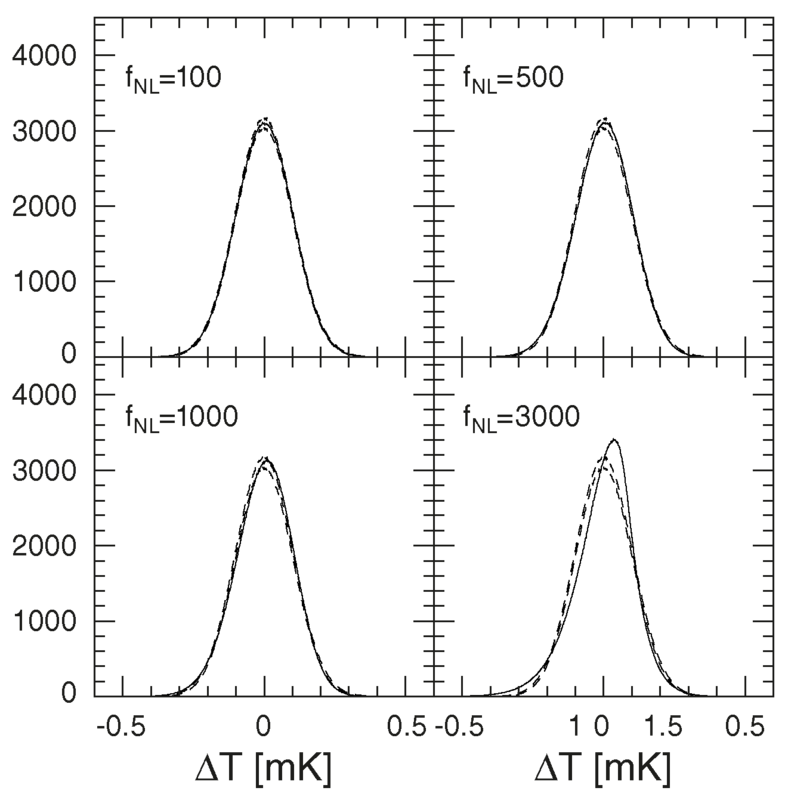 From the top left to the bottom right panel the solid lines show the PDF for ƒNL = 100, 500, 1000, and 3000, while the dashed lines enclose the rms scatter of Gaussian realizations (i.e., ƒNL = 0). Distribution of the nonlinear coupling parameter ƒNL (left panel) and the point-source bispectrum bsrc (right panel) measured from 300 simulated realizations of non-Gaussian maps for ƒNL = 100 (solid line) and ƒNL = 0 (dashed line). The simulations include noise properties and window functions of the WMAP 1 yr data but do not include point sources. Testing the estimator for the reduced point-source bispectrum bsrc (eq. ). The left panel shows bsrc measured from a simulated map including point sources and properties of the WMAP sky map at the Q band, as a function of flux cut Sc ( filled circles). Black, dark gray, and light gray indicate three different realizations of point sources. The solid line is the expectation from the input source number counts in the point-source simulation. The right panel compares the power spectrum csrc estimated from bsrc with the expectation. The error bars are not independent, because the distribution is cumulative. 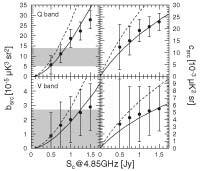 The behavior for Sc > 2 Jy shows the cumulative effect of sources with brightness comparable to the instrument noise (see text in Appendix B).